Bristol-Myers Squibb’s inclusive new family care leave program broadens the definition of family to include all types of caregivers and family members of all ages who need care. Each eligible employee caregiver – from those caring for an ill family member to new parents of birth, foster, or adoptive children – may take up to eight weeks of paid leave. The program is open to all U.S. employees, including hourly workers provided they meet the eligibility requirements for the program. For Ryan and Heather Fischer, the expanded benefits couldn’t have come at a better time. The parents of two-year-old Adelaide are both employees at Bristol-Myers Squibb. 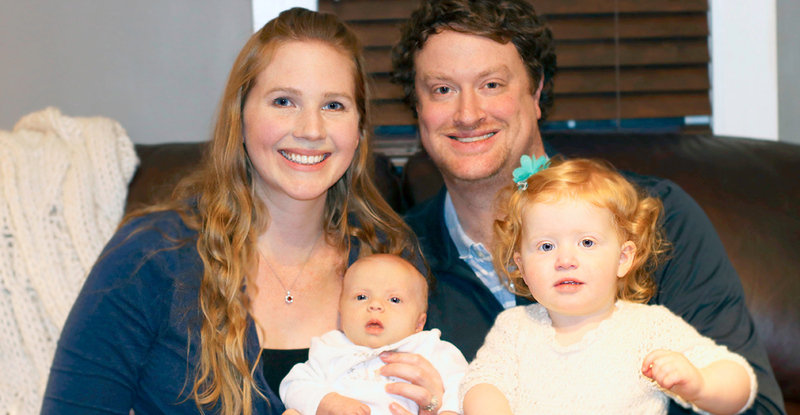 On January 24, the Fischers welcomed their second daughter Colette into their lives. With dual benefits since they are both employees, the couple is eligible for eight weeks of paid family care leave each to care for their young family. Flexibility is a key feature of the program. Just as Ryan is breaking up his time off, all eligible employees can use their paid leave all at once or in intervals throughout the year, based on their personal situations and consistent with the policy terms. Paid family care leave programs like Bristol-Myers Squibb’s result in talent retention benefits and improve employee motivation, productivity and health, according to recent reports. The Bristol-Myers Squibb program helps the company achieve its commitment to attracting and retaining the best talent to help discover, develop and deliver innovative medicines that help patients prevail over serious diseases. “Our expanded family care leave program is consistent with the value we place on our people as our key competitive advantage,” said Judge. Learn more about Bristol-Myers Squibb’s commitment to employees and patients by visiting Working with Us.